As the unrivalled world-leader in battery chargers, CTEK are the brand to watch when it comes to your charging needs. Selling 6.2 million battery chargers each year in 70 countries, they’re the only brand to globally conquer a market that’s normally reserved for smaller, local manufacturers and wholesalers. These days, CTEK are known for their premium range, supplying OEM battery chargers to Porsche, Lamborghini, Audi, Maserati, BMW and even Maybach. But don’t worry, no matter what your ride is they’ll have a charger for you… that’s where the MXS range comes in. Why a CTEK MXS Battery Charger? While small and compact, you should not let the CTEK MXS range fool you – they are powerful and host a range of capabilities. They are (literally) smart battery chargers that, opposed to your everyday charger, communicate with your car battery and read its vital levels as they charge. This means that your battery is always getting the exact amount of charge it needs to start as quickly as possible, first time, every time. 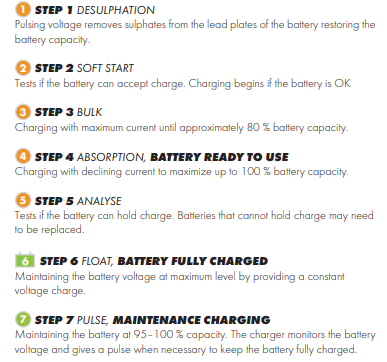 While most battery chargers provide a trickle of constant power into your battery once it’s fully charged, CTEK battery chargers allow your battery to naturally discharge and then provide a pulse of power to get it back up to full again. Ensuring your battery is at its healthiest! The result? A battery that lasts longer from every charge, provides more reliable starting performance and does its job without you ever having to worry about failure or malfunction. When you get right down to it, the difference between CTEK and their competitors is pretty simple – CTEK is passionately committed to helping you maximise the performance of your battery. And every single one of their products is engineered with that singular purpose in mind, evidenced in the patented charging modes; layered protections and safety features; their multi-stage charging processes. 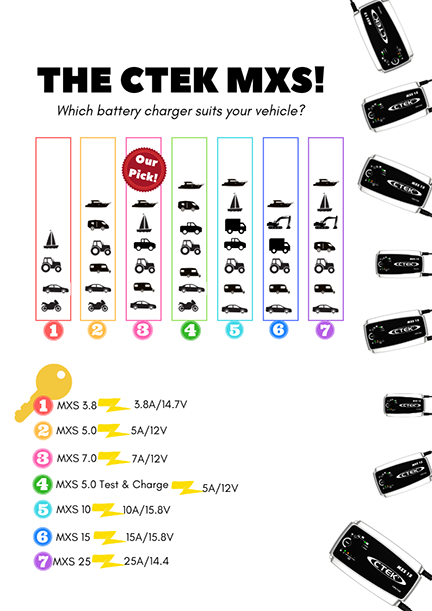 Which CTEK MXS Battery Charger is for me? There are many different issues to consider when deciding which kind of battery charger you’ll need in order to keep your vehicle’s battery in prime working condition. What kind of vehicle do you have? Is it a car? A truck? A jet ski? What kind of battery does it have? And do you need any special modes of charging based on how you use the vehicle?